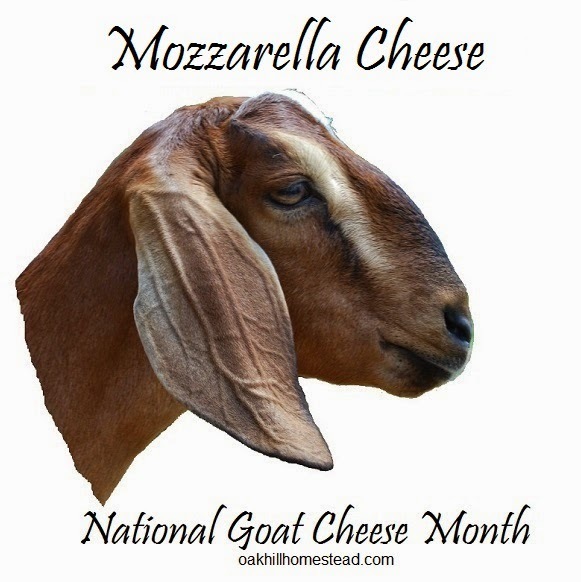 August is National Goat Cheese Month. Just for fun, I challenged myself to make a different kind of cheese from goat milk every week - some that I've made before and some that are new to me. The kind folks at Hoegger Supply Company, my favorite place to buy goat supplies, said that sounded like fun! 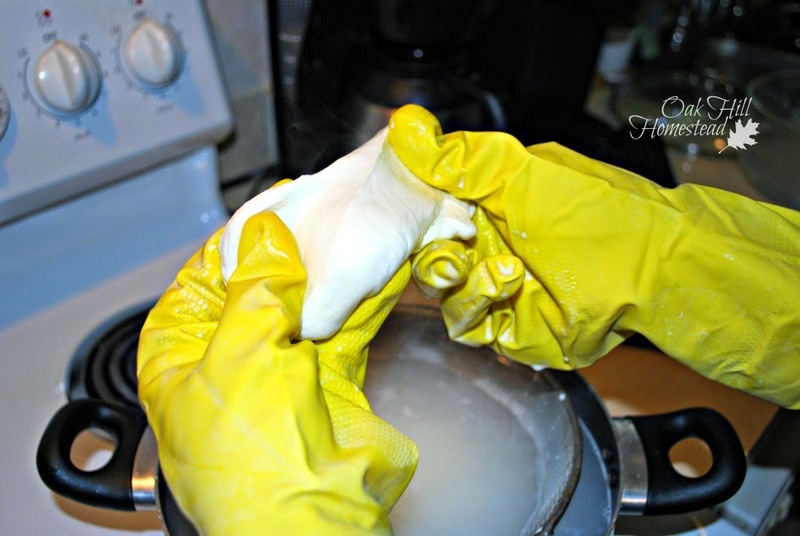 They have provided the mozzarella kit I used in this post. My many thanks go out to them. My Nubian goats - Phoenix, Ziva, Firefly, and Felicity - are providing the milk I'm using to make the cheeses. Mozzarella was my goal this week. I must admit I approached this one with a lot of trepidation, since I've tried to make it twice in the past and failed utterly (udderly?). So this time I started early in the week in case I had to try more than once. Sure enough, I did have to make it twice, but this time the reason was my camera battery died halfway through the first batch. Great timing. You can't stop in the middle of cheese making! But you know, that wasn't a bad thing. I learned from that first batch. When I read over the directions again afterwards, I realized where I'd made my mistakes. I let it get too hot at one point and the curds were much firmer than they should have been. 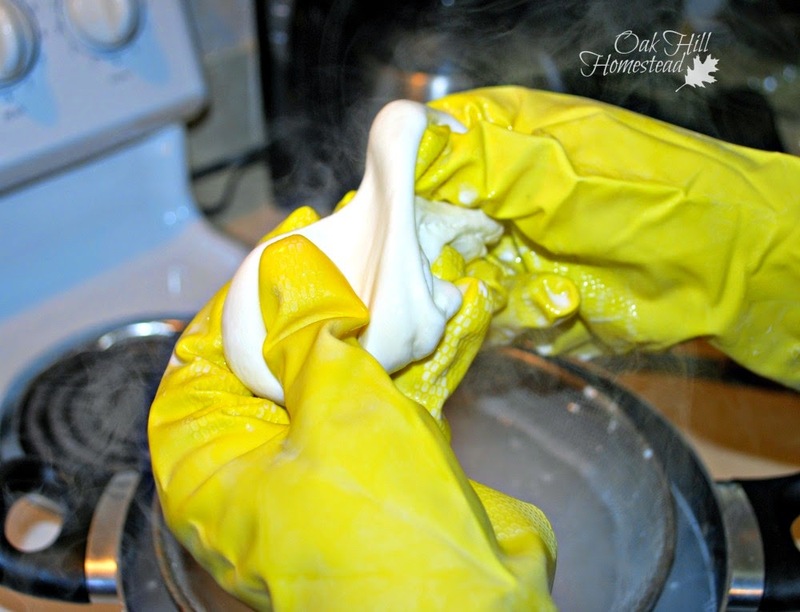 But I did get to practice stretching the curds, even though they were far from perfect, and I "got it" eventually. I consider this a complicated cheese; it's not hard but there are so many steps you need to remember. 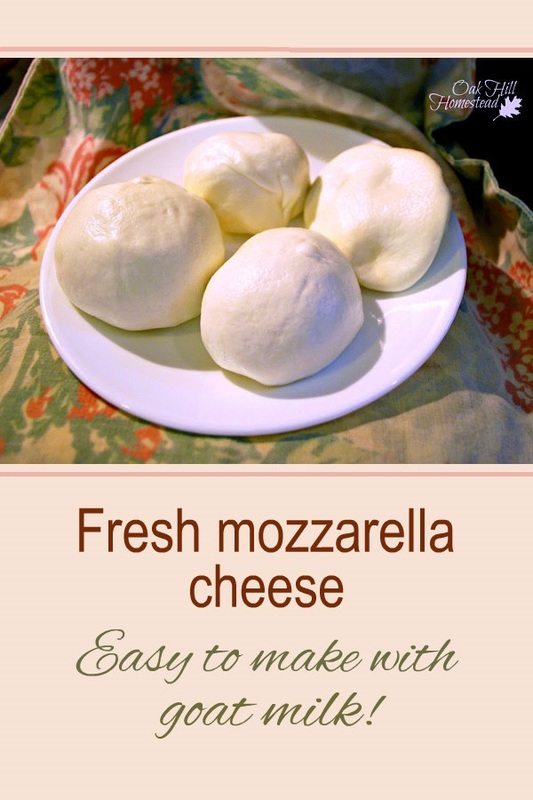 I used Hoegger Supply's "mozzarella kit" which contains these last 3 ingredients; all you add is milk! To start, I dissolved the 1 1/2 teaspoons of citric acid in one cup of cool water in a bowl - I used filtered water rather than tap water. In a second bowl, I measured another 1/4 cup of cool water and added 1/4 teaspoon of liquid rennet. If you don't have liquid rennet, you can use a quarter of a tablet of rennet. Here's a tip - none of the recipes that I read mentioned this, but I will be doing it in the future. Put a pot of water on the stove and begin heating it up. You want it to be about 190°F; don't let it boil. I poured the gallon of cold milk into a stainless steel stockpot. I store milk in quart jars in the refrigerator, so I used four jars. I added the water and citric acid. I set the pot of milk on medium high heat and warmed it slowly to 90°F, stirring gently. When the milk reached 90° I moved the pot off the heat and stirred in the water and rennet. I stirred the milk gently for 30 seconds (I counted to 30), then covered the pot and let it sit undisturbed for five minutes. After five minutes, the directions said if it wasn't set enough - if the curds looked too watery - to put the cover back on the pot and leave it for another five minutes. Mine looked fine though, like custard, so I continued. The curds were like a layer of tofu or custard, and I was supposed to cut the layer into similar-sized cubes, so I used a long knife, cutting first in one direction and then across in the other direction. This was kind of difficult because the mass of curds kept spinning around the pot while I was trying to cut, but eventually I managed to cut it all into cubes. The directions said to make sure the knife reached all the way to the bottom of the pot. Next, I put the pot back on the stove over medium heat and heated it up to 105°. This didn't take long at all, so don't let your attention wander. (This is where I overcooked my first batch.) Again, I was supposed to stir slowly as it warmed but not break up the curds too much. Directions like this are hard for me: where is the fine line between enough and too much? I removed the pot from the heat again, and continued to stir for another five minutes. 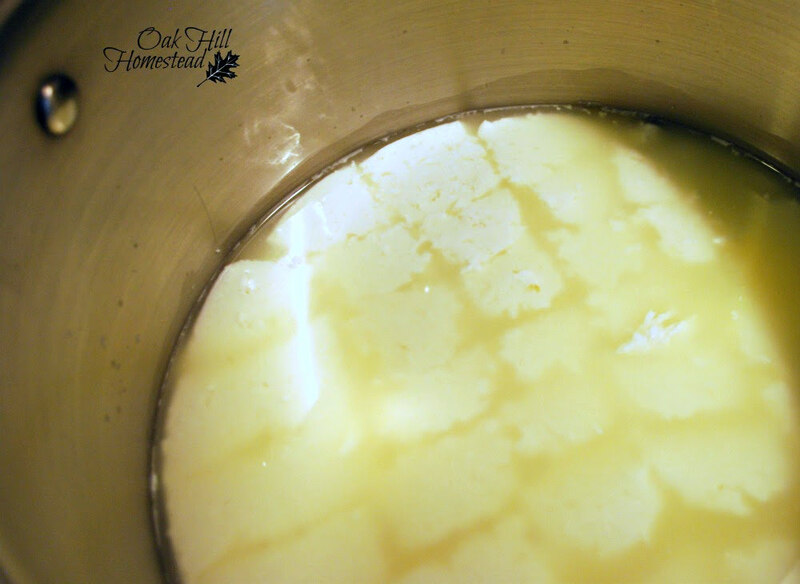 The cubes of curds began to stick together and formed a big clump so that it was a mass of curds in the liquid whey. It kind of looked like a lump of marshmallow cream. Then I ladled the curds out of the whey into my wire strainer with a slotted spoon. 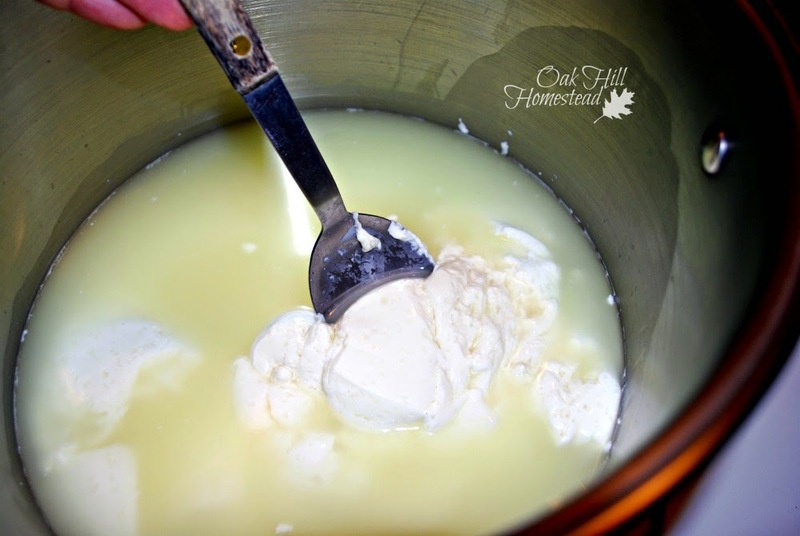 I turned the curds over a few times in the strainer to let the whey out of the little nooks and crannies. This is when you need that pot of water that you put on the stove at the beginning! It's handy to have it ready when it's needed, and not have to wait for the water to get hot while worrying about the curds getting too cold. I set the strainer of curds in the pot so that the curds were submerged, and let them warm up in the water for five minutes. I stuck the thermometer inside the curds; the interior should be 135°. 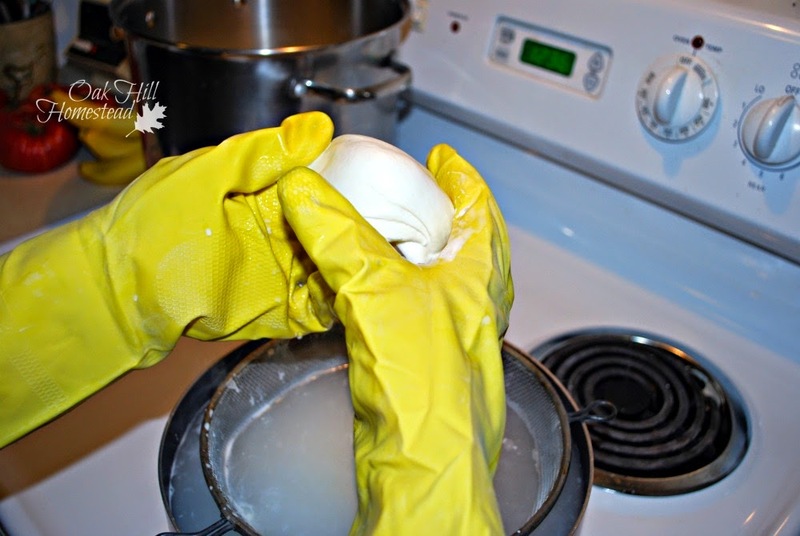 I donned my rubber gloves and asked hubby to help out with the camera. At this point you're supposed to add cheese salt to the curds, which I forgot to do! The directions say to sprinkle salt over the cheese and squish it with your fingers to mix it in. I didn't realize that I'd forgotten until much later. Do what the directions say, not what I did. The curds, which used to be one solid mass that was rather stiff, were now melty and squishy after warming up in the water. I needed to turn off the heat under the pot after stretching the first two balls of cheese. Don't let the water start to boil. The mozzarella is ready to eat immediately, and we did! If you want to store it in the refrigerator, mix a teaspoon of salt with a cup of the cool whey and pour it over the cheese in a small container, then refrigerate. It should keep for about a week. Honestly, I'm glad I had to make two batches. The first batch taught me a lot. The second batch was so much easier and turned out perfectly, other than forgetting to add the salt. I learned a few tricks, like getting that pot of water heated up before I needed it. When I began stretching the second batch, the difference was amazing and I could tell that it was "right" because I'd already struggled with that first batch that was "wrong." 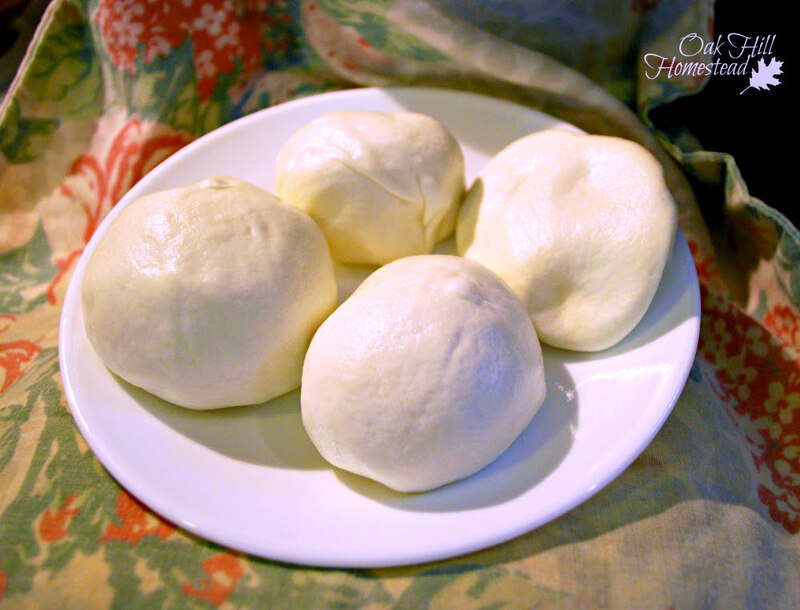 I'm looking forward to making my homemade pizza with homemade mozzarella on top, and to making calzones. Need cheese? Make some! Rose, it would be fun to make with a friend! Plus the friend could read the directions so you'd know what to do next. Maybe then one would not forget to put in the salt. 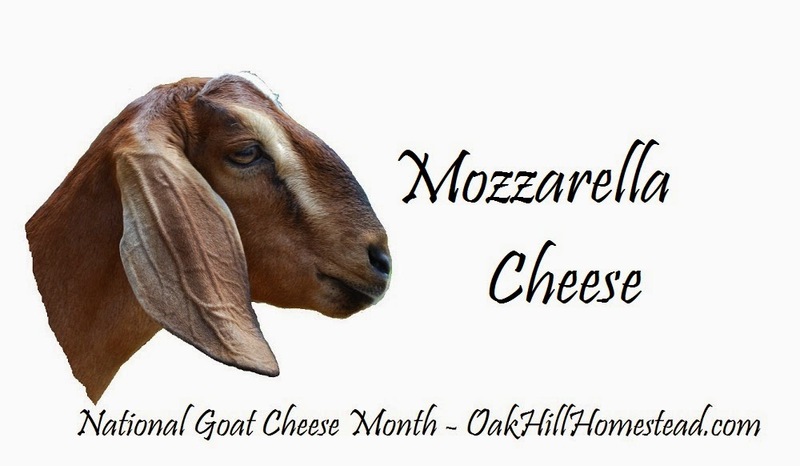 Thank you for making mozzarella, Kathi. I had never 'seen' anyone else make it. I like to learn from the different techniques other folks use. I stretch mine with two large spoons instead of by hand, but I like the way yours formed up into nice round balls. I also had never heard of storing it in salt water in the frig. That is interesting. 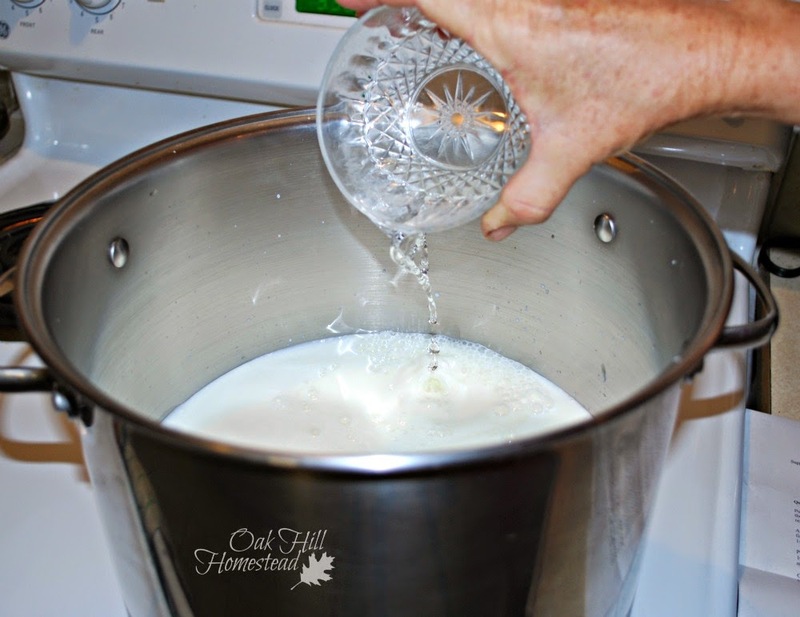 When I heat my milk, I use two different sized stock pots I can nest as a double boiler. It works great. Thanks again for sharing this. I look forward to a post on how you make pizza. Then I can compare notes again. Fern, as I was milking this morning I was thinking about those nested stockpots you have. Have you ever filled the larger one up with ice water and taken it to the goat barn with you - with the smaller one nested inside to milk into - to start chilling the milk immediately? Thanks for sharing! It's especially nice to hear about the mistakes someone makes so you can learn from it! I keep on trying to gather the courage to make my own cheese! Beautiful photographs. Thank you for detailing each step and for explaining potential problems. So helpful. I agree, Sarah, it's very helpful to know where someone went wrong so you can avoid making the same mistakes. As for courage to make your own, just jump in there and give it a try. The worst you can do is fail, and you'll learn from it and do better the next time. Thank you, Anonymous. Knowing the potential problems makes doing something for the first time much easier, it gives one confidence in trying something new. That looks yummy!! My GF makes soft cheese from her goats milk and is delicious..no off taste. She canned 17 qts of milk but it did not seal... Everything was sterilize and in a pressure canner. Any suggestions why?? 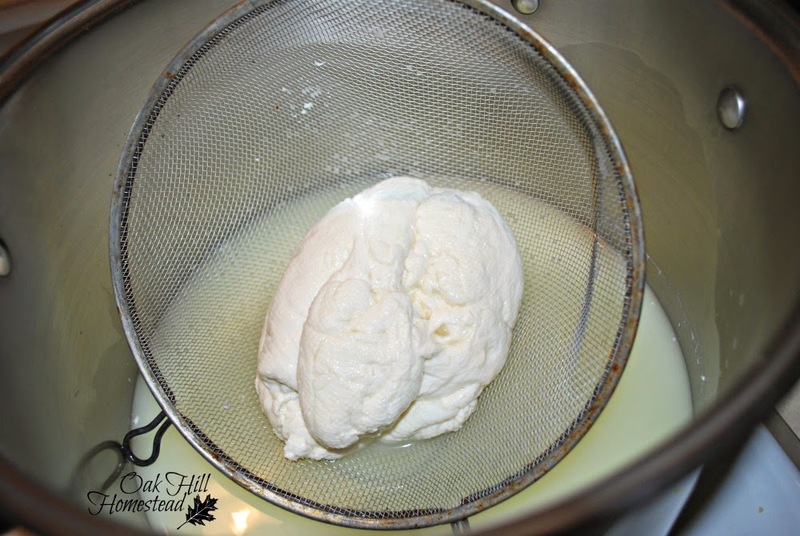 I have been making my own mozzarella for a few years now. It's now consistently coming out correctly. It's amazing how one little slip up can change the outcome!! 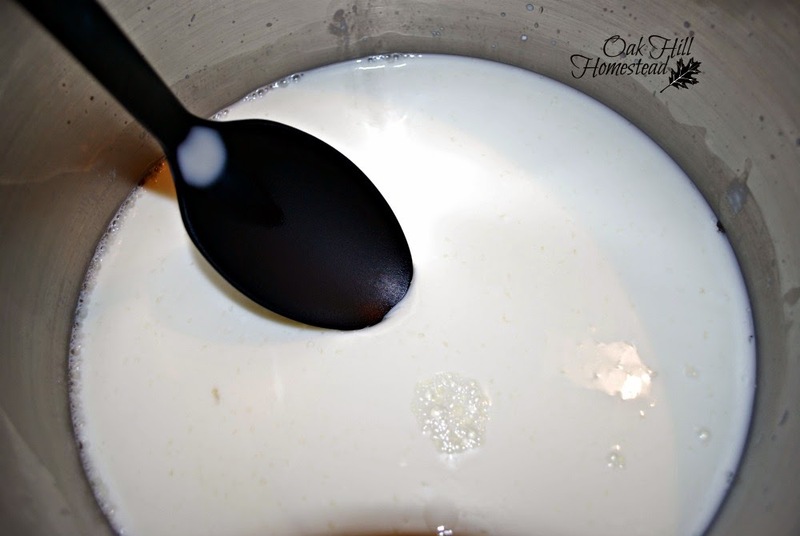 In my recipe, there is a suggestion to not heat above 88 degrees if using raw milk. The cheese comes out moister (supposedly). Then, I heat to 110 degrees for a water bath. But apparently you can make mozz in the microwave!!!! Good luck in the rest of your cheese endeavors!! Great post, as usual, Kathi! I have never made mozzarella before, so this one is getting pinned for future experimentation! I hope this post helped to make the recipe clear, Janet. 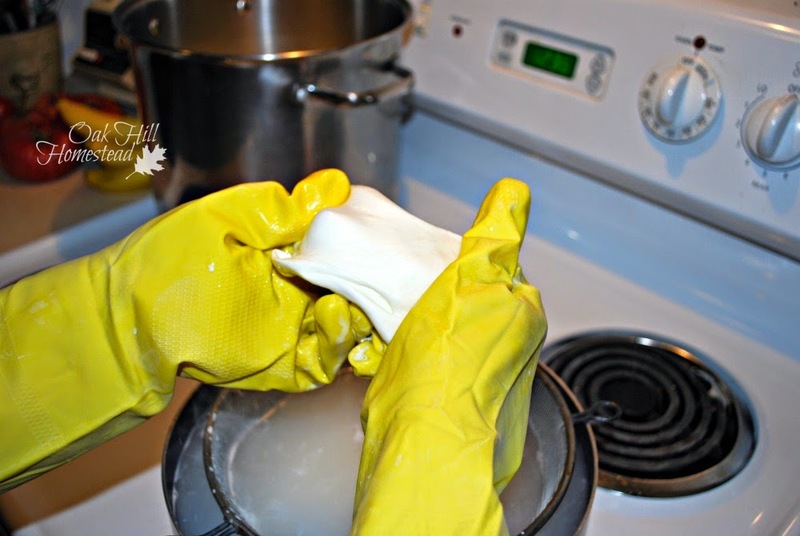 There are a LOT of steps to making mozzarella; they aren't hard on their own, it's just that there are so many things to remember to do. Good luck on your effort! Thank you, Heidi. I hope you have a chance to try these sometime. It's so fun being able to make your own cheese! I pinned this tasty looking recipe the first day you posted it :) Thank you for linking up with the Art of Home-Making Mondays! Thank you for pinning it, Jes! 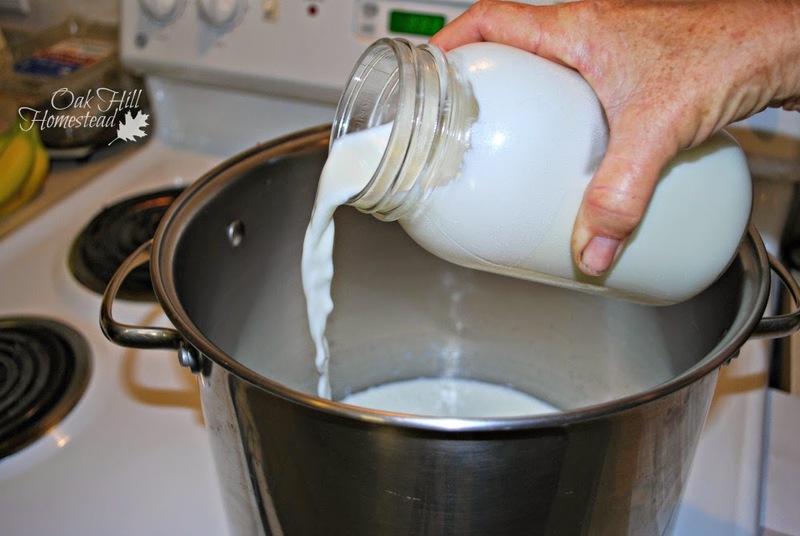 Linda in NM, I've never tried canning milk so I don't know what went wrong. Maybe it was a bad lot of lids? or the jars were too full? Wow, this looks so good! Love the step by step instructions! Saying hello from strut your stuff Saturday and I really enjoyed spending some time on your blog! Welcome, Cathy; thank you for stopping by! Great tutorial. If I had a goat I would try you make it look simple! I will try the salad. I haven't had it in a long time thanks for the reminder. I happen to have some very nice Mozzarella,tomatoes and my own grown Basil. Yea me! Perfect for supper tonight! I enjoyed this post. Have a wonderful weekend. Enjoy that salad, Sherry. It's sure to be delicious! After reading your post I really want to make cheese!!! Thank you for sharing at Tuesdays with a Twist. YOU have been featured at Back to the Basics this week! Thank you, Mary! How exciting to be featured!